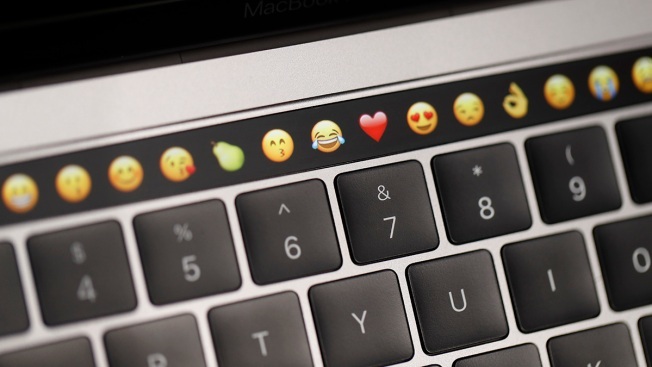 In this file photo, emoticons are displayed on the Touch Bar on a new Apple MacBook Pro laptop during a product launch event on October 27, 2016 in Cupertino, California. If you find yourself frequently sending the heart or face with tears of joy emojis, you're in good company. Those are among the most commonly sent emojis on Facebook and Twitter. The social media networks revealed Tuesday the emojis that are most often shared in posts and messages most often Tuesday, which is World Emoji Day. It falls on July 17 because that date appears on the calendar emoji for iPhone and Android users, according to Fortune. Facebook users post the heart emoji twice as much as they did last year, the network said in an email to NBC. More than 2,800 emojis are used on Facebook and its Messenger app each day. The heart-eyed face, blushing face, kissing face and birthday cake are among the most popular emojis used on Facebook. The loudly crying face emoji is the lone emoji that appeared on Twitter’s top-five list that wasn’t on Facebook’s. Emojitracker, which attempts to track the use of all emoji on Twitter, finds that the aerial tramway emoji is the least used on the platform. The mouse face, juggling and blocked number one emojis are among the least popular on Facebook. Two variations of a smiley face emoji were among the top searched emojis worldwide last year, according to Google Trends. Apple celebrated World Emoji Day by announcing its plans to roll out more than 70 new emojis in a software update that’s scheduled to be released later this year. The new emojis feature people with red hair, gray hair and curly hair and people who are bald, according to a news release. Emojis originated in Japan, according to NBC News, and the Unicode Consortium ensures that the emojis can be recognized on any device worldwide. The group also controls what emojis are created. When an emoji becomes part of an update, designers at platforms like Apple and Google determine how it will appear on their devices. The consortium accepts emoji proposals, though the process can be long.